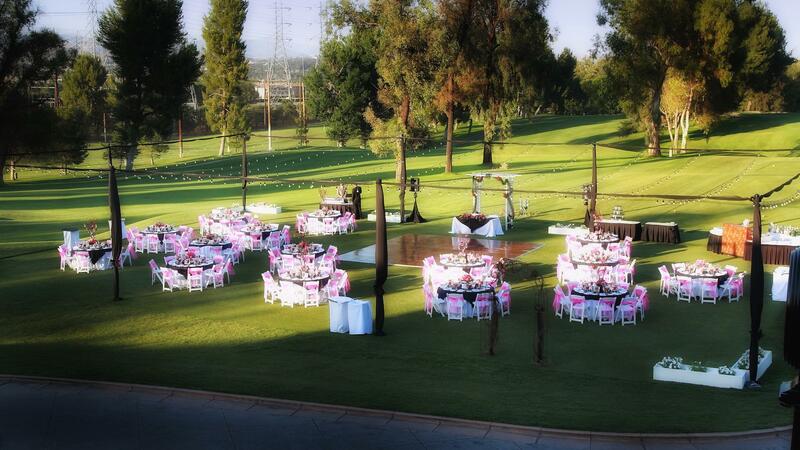 Rent Valencia Country Club | Corporate Events | Wedding Locations, Event Spaces and Party Venues. Set against a stunning backdrop of lush fairways and stately trees, Valencia Country Club exudes elegance and grandeur, while offering the finest in services and exquisite cuisine for any type of special event. the Club. A wedding rehearsal time may be scheduled, subject to Club availability. $1,500.00 Ceremony Fee. Set behind our 10th Tee Box, you will find yourself surrounded by lush, emerald green fairways, offering you the chance to experience your special moment under the stars. Our stunning outdoor reception site is the perfect setting for groups of up to 350. Minimum includes set up fee. Our stunning ballroom features luxurious décor and a panoramic golf course view. With private use of the Valencia Lounge and wrap-around terrace, this room is perfect for parties and groups of up to 160 guests. The Santa Clarita room is the perfect location for your meeting, luncheon, dinner, or for a party of up to 60 guests. Privacy, elegance, and beautiful golf course views make this the ideal space for your group.